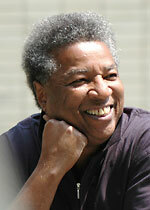 Steven Osgood guides composers in a previous season of Composers & the Voice. Created in 2002 by former AOP Artistic Director Steven Osgood, Composers & the Voice – AOP’s nationally recognized annual composer workshop series – has not just been a training ground for emerging composers, but also an incubator for dozens of new operatic works over the years. AOP has announced that the 2008-09 season of Composers & the Voice will focus exclusively on the development and presentation of the works of C&V alumni. AOP Executive Director Charles Jarden states, “The new season will allow audiences and financial sponsors more access to the music from the workshop program that has traditionally been closed to the public.” Funders that joined the growing supporters of this unique fellowship offered to composers include The BMI Foundation and The Virgil Thomson Foundation. This summer has already seen partnering organizations such as The Walt Whitman Project, Opera on Tap, and Make Music NY create programs around C&V songs, delighting audiences from Theater Ten Ten in Manhattan to the feisty back room bar at Freddy’s in Ft. Greene Brooklyn. In October, C&V Six Scenes 08, the final presentations of the 2007-08 composer class, will be held in Brooklyn. In the 2008-09 Season, C&V will not be accepting new proposals or applications. Composers and librettists are requested to keep checking the website for updates. One of the highlights of the New York area’s opera season was the presentation of two of Lee Hoiby’s operas — specifically, the first professional production of his 1992 one-act This Is the Rill Speaking and the New York premiere of the latest revision of his 1986 grand opera, The Tempest. Both works were presented at SUNY Purchase in late April, under the aegis of the University and American Opera Projects. 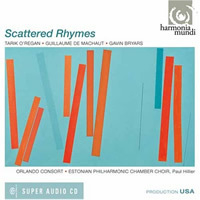 Subsequently, This Is the Rill Speaking was performed in New York City’s Symphony Space. On April 26, both operas were performed, with a panel discussion occurring between performances. Based on the play by Lanford Wilson, This Is the Rill Speaking is an opera without a traditional dramatic framework. It offers a series of vignettes of American small-town life as it was in the postwar era of the late 1940s and early ’50s. Literary and dramatic touchstones would include Winesburg Ohio, Spoon River Anthology, Our Town and Under Milkwood. The music is precious and nostalgic without being cloying, lyrical and emotional without overstatement. Hoiby’s light, exquisite scoring adds tremendously to the music’s impact. The six cast members — Abigail Fischer, Andrew Garland, Malinda Haslett, Nicole Mitchell, William Ferguson and Justin Petersen — each performed in multiple short roles. To their credit, and that of director Ned Canty, the listener managed to retain a sense of which of their characters they were enacting. Each of these young singers deserves a paragraph of praise. Suffice it to say that we can expect further great performances from them, and that the future of American opera is in good hands. The performance space at Purchase was rather small. Fortunately, scene designer Glenn Reed and lighting designer Peter West were up to the challenge, making creative use of the entire stage. Benton Hess and the AOP Orchestra provided sensitive, assured accompaniment. Read the full Washington Post review here. A workshop of O’Regan’s opera Heart of Darkness will be presented by AOP and Opera Genesis in August at the Linbury Studio of the Royal Opera House in London. AOP is doing a bit of social networking these days by joining Facebook. If you have a Facebook profile, join the AOP group to be invited to events, view pictures and videos, join in discussions, read articles, and meet new people. Click here to be a part of AOP’s Facebook group! 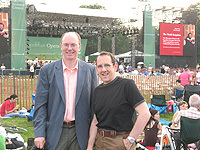 J. David Jackson (left, with AOP Board Member John Buscarello) at the Metropolitan Opera's summer concert in Prospect Park, Brooklyn. AOP conductor J. David Jackson (Darkling, Marina: A Captive Spirit) was the cover conductor for the Metropolitan Opera’s concert in Prospect Park, Brooklyn that drew a crowd of 50,000 on the evening of June 20. The concert featured the soprano Angela Gheorghiu and the tenor Roberto Alagna performing famous opera arias and duets. On Saturday, June 21, AOP held its own summer concert in a Brooklyn Park one day after the Metropolitan Opera’s presentation. A crowd of less than 50,000 was on hand in Fort Greene Park to watch AOP and friends performing all new opera arias and duets as part of the free festival Make Music NY. AOP performed songs from this year’s C&V composers based on the writings of Brooklyn’s own Walt Whitman in between presentations from Opera on Tap, Collective Opera Company, and Rhymes With Opera. Greg Trupiano, Artistic Director of the Walt Whitman Project, introduced each of the songs with information about their source poems, including one poem that was written only a block away from where the performance was held. The show was also held earlier in the day at Lincoln Square in Manhattan. AOP is proud to announce that Meet the Composer has awarded AOP and composer Alvin Singleton a “Creative Connections” grant for Singleton’s participation in the development and outreach programming of a newly commissioned work. The work, a dramatic oratorio for chamber orchestra and chorus with a commissioned text by author Patricia Hampl, is about the 100 year-old Prison Ship Martyrs Monument in Fort Greene Park, Brooklyn. The commission has been paid by The Fort Greene Park Conservancy, with funds raised through a consortium of organizations, city, state and private donations. AOP will partner with these organizations to develop the work, building national and community awareness about the subject in advance of the November 2008 rededication of the Monument. You are currently browsing the Have a Voice blog archives for July, 2008.